I’ll be honest. Soft toys drive me mental. I’m quite sure they breed overnight. Add the fact that my kids’ grandparents always seem to return from holidays with large, plush souvenirs that find their way to my house. And of course the kids will not part with any of them. So what to do with all of these cuddly friends? Put them in The Zoo of course! 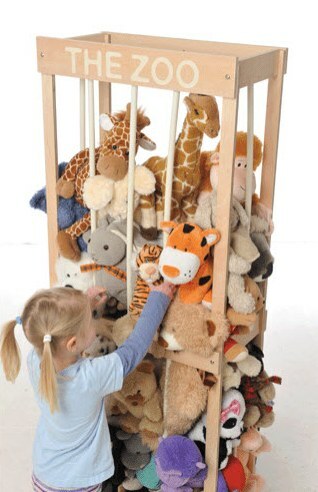 The Zoo is a neat soft toy storage solution that holds up to ninety soft toys. The Zoo provides easy access to the toys so that even if a favourite teddy is on the bottom of the stack, it’ll still be able to escape with a little help! The bars of The Zoo are made of a special tubing encasing bungee cord, allowing them to spring gently back into place when soft toys are added or removed. You can also increase the tension of the bars depending on how heavy your toy load is. I like the fact that The Zoo is easier to install (and less permanent) than the hanging toy nets that are commonly used to store soft toys. Plus it’s not confined to just soft toys – it’s a great way to house balls as well (I’m thinking that I could fill a Zoo with footballs, given the number my three boys have!). 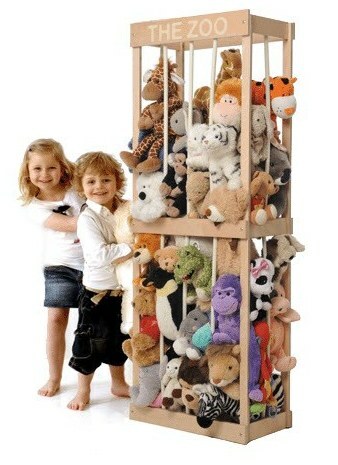 The Zoo is available from Soft Toy Storage Australia for $187 (including delivery).